In Part 1 of this series was a brief retrospective of some of the antecedents of today’s discussion of residential rates in California. In Part 2, we discussed in more detail the concept of inclining block rates, the policy rationale behind them, and how residential electricity rates look today in California. In the third and final part of this series we will discuss legislative actions to address residential rates. In Part 2, we left off with a look at the current residential rate structure for San Diego Gas & Electric customers. With increases in costs allocated to the upper tiers until the Department of Water Resources bonds are recovered, the upper tiers have grown significantly to the point where the average rates for the upper two tiers are nearly double that of the lower two tiers. As a result of SB 695, rates for Tiers 1 and 2 have increased slightly in the past couple years. 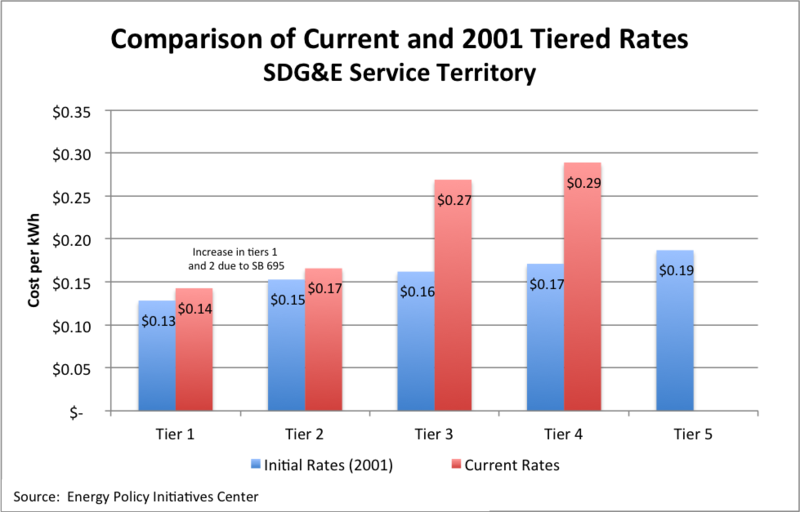 For example, the figure below shows a comparison between Tiered rates in place in 2001 and current rates. Tiers 1 and 2 have increased slightly due to the effects of SB 695. Tiers 3 and 4 have risen proportionately higher because of the AB 1x cap of Tiers 1 and 2. As mentioned in Part 2, there are at least two general policy rationales for inclining block rates: (1) to encourage conservation, efficiency, and self-generation by sending a price signal to high users and (2) to mitigate the effect of rate increases on lower consuming – presumably lower-income – customers and to ensure that essential uses of electricity remained affordable for all customers. (Borenstein 2008, National Action Plan for Energy Efficiency 2009, Faruqui 2008). Below is a brief look at the arguments for and against the current rate structure. Here are a few arguments supporting current rates. Use More, Pay More – One argument in favor of current rates is that high consuming customers should pay more than lower using customers. Equity – The lowest consuming customers, who presumably are in lower income categories, should not bear the full effect of cost increases. Price Signals – Supporters of this structure also argue that higher upper-tier rates encourage conservation, efficiency, and distributed generation, such as solar photovoltaics. And here are a few arguments critical of current rates. Fairness – Critics of the current structure argue that because AB 1x caps Tiers 1 and 2, the higher Tiers are subsidizing the lower Tiers. In effect, the upper tiers are paying a price for electricity that is higher than the cost to deliver that energy and the lower tier customers are paying a price lower than the cost to deliver energy. Equity – Another argument against current rates is that some lower tier customers are upper-income customers and some higher-tier customers are low-income. Geography may contribute to this phenomenon: coastal communities may have lower consumption given the cooler climate. Cost Causation – A central principle of ratemaking is cost causation; that is, charging a rate based the cost incurred to serve a customer or class of customers. If increased costs to serve tier 1 and 2 cannot be appropriately allocated to those customers, cost causation is not possible. Even though the arguments presented here are related, it is important to parse them a bit for clarity. For example, the argument that higher marginal rates encourage efficiency and photovoltaics should be seen as support for inclining-block rates. It is worth having a discussion of whether inclining block rates lead to certain policy outcomes (look for a future blog post on what the literature says about whether inclining block rates encourage efficiency and conservation), but the discussion should not be clouded by the fact that tiers 1 and 2 are capped (a result of AB 1x). If we agree that inclining block rates are appropriate, a discussion of the rate increases between tiers should follow. Similarly, the issue of the cap on tiers 1 and 2 may be best discussed separately. What are the consequences of the cap on equity, cross subsidization, fairness? On balance, the discussion may come down to whether the benefits of price signals that encourage behaviors and outcomes that support California energy and climate policy outweigh the fairness of upper tiers subsidizing lower tiers. One important lesson in this saga of residential rates is that it is risky for any legislative body set utility rates by statute. It is understandable that legislators sought to mitigate an otherwise disastrous situation during the Energy Crisis of 2000-2001; however, it can be difficult to change the law, especially when, as pointed out in Part 2, may result in a rate increase for a significant portion of voters. The legislature is currently considering AB 327, which takes a different tack from AB1x and SB 695. It would, among other things, replace the provisions codified by SB 695 (Public Utilities Code 739.9) with language that establishes rate making principles that the California Public Utilities Commission would have to follow when considering changes to residential rates. The principles included in AB 327 are the same as those guiding the ongoing CPUC rulemaking (Scoping Memo R.12-06-013). “739.9. (a) In approving changes to the rates and charges to residential customers for electricity usage pursuant to this part, the [Public Utilities Commission] shall determine that the changes are reasonable, including determining that the changes are necessary in order to ensure that the rates and charges paid by residential customers are fair, equitable, and reflect the costs to serve those customers. (1) Low-income and medical baseline customers should have access to enough electricity to ensure that basic needs, such as health and comfort, are met at an affordable cost. (2) Rates should be based on marginal costs. (3) Rates should be based on cost-causation principles. (4) Rates should encourage conservation and energy efficiency. (5) Rates should encourage the reduction of both coincident and noncoincident peak demand. (6) Rates should be stable and understandable and provide customer choice. (7) Rates should generally avoid cross-subsidies, unless a cross-subsidy appropriately supports explicit state policy goals. (8) Incentives should be explicit and transparent. (9) Rates should encourage economically efficient decision-making. (10) Transitions to new rate structures should be accompanied by customer education and outreach that enhances customer understanding and acceptance of the new rates, and should minimize and appropriately consider the bill impacts on customers associated with the transition. AB 327 has passed out of the Assembly and is making its way through the Senate. If enacted, it will inform the ongoing Rulemaking (R.12-06-013) at the CPUC. Note that another bill, SB 743, is also making its way through the legislature. It makes changes to residential CARE rates for low-income customers. It remains to be seen what the outcome will be from the current effort to revisit residential rates, but it is safe to say that there will be changes to the current structure. This entry was posted in Energy and tagged California, Electricity, rates, Residential. Bookmark the permalink.